As always, I made time during the Thanksgiving long weekend this year to attend the San Francisco Auto Show. The 2015 version was no different than last year’s event. It’s essentially a huge showroom without pesky salespeople–where you can look at all the cars, sit in them, grab a little information, and get exhausted. This year, I focused on electrics, hybrids, plug-ins, and alternative fuel vehicles, while looking at what’s new, too, and strolling nostalgically past some classic treasures. The first thing I noticed in the far-ranging Moscone Center was that most cars are none of the above. If you’re lucky, there’s one per brand. Some, like Ford, offer multiple options, but you still have to seek out the environmentally friendly models, and the areas around them were generally not busy. The big news this year comes from a new Chevrolet Volt and Toyota Prius. Both were there in multiples. 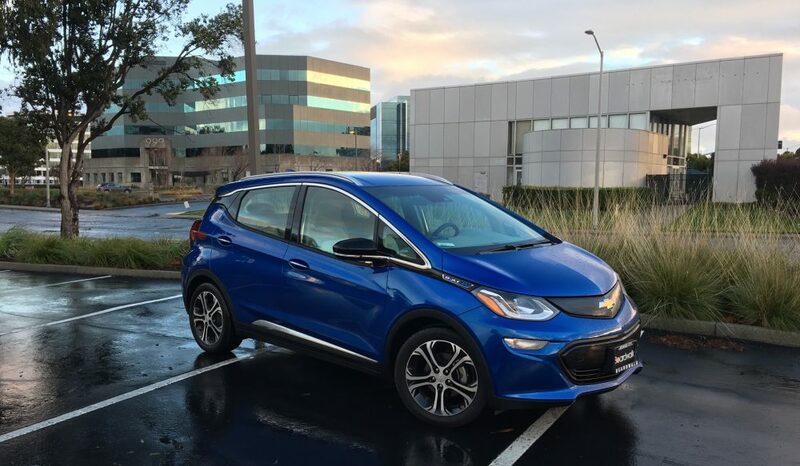 The Volt (above) has been totally redesigned, and is both more attractive and more efficient. While the old model was loosely based on a radical concept car, this new Volt looks more like other new Chevys–which is better. It’s also has a bigger range in pure electric mode. I first saw the Volt as part of the PG&E display, and wore its logo on the side. PG&E wants consumers to understand what buying and living with an electric car means, as the friendly utility that supplies their car-charging juice, and they featured some helpful displays and take-aways. The company also got a chance to display their hybrid Ford work trucks. According to the PG&E spokesman, who actually works on one of the trucks, the guys just love them. Over in Toyota land, several Prii (Priuses) sat next to one Toyota Mirai, the company’s entry in the hydrogen fuel cell segment. The Mirai, for lease to a tiny group of early adopters willing to be beta testers for a car with virtually no places to fill it up, is one of the least attractive vehicles I’ve ever seen, but if and when hydrogen becomes a viable fuel to power automobiles, Toyota hopes to lay claim to the “Prius” of hydrogen cars by starting now. The new Prius still looks something like the generation two and three models, but has gone wild, much as the latest Camry has, in an effort to refute any accusations of being boring. Mind you, the Prius is fabulous for getting there on minimal fuel (an honest 50 miles per gallon), but has never been a sporty ride. The new car, with floating roof, head- and tail lamps that are splattered across the corners of the car, and a dash panel that hides the information away from your eyes, will be polarizing. According to reports I’ve read before getting my hands on one, it is more fun to drive, intentionally. I can’t wait to find out. If you simply want to save fuel by driving a tiny car, the all-new Smart is here. Looking a bit more substantial, but still like half a car, it is not the highest in fuel economy (although an electric is offered). It is simply the best to park, and is still very cute. Where it gets more interesting is in places like Volvo, that now offers a hybrid version of its handsome, all-new XC90 crossover. Winning Motor Trend’s SUV of the Year competition places it more directly in front of potential buyers. The young woman showing it off told me that a pure electric is in the future, pending availability of more powerful batteries for longer range. The Porsche 918 was there, as was the BMW i8, proving that you don’t have to drive a regular car to conserve fuel. The Porsche will set you back at least half a million dollars, while the BMW is a more “modest” $125K or so. Both surely occupy some teenage boys’ walls next to the Ferraris and Shelby Mustangs. One note on regular cars. The new Honda Civic was there, and I was looking forward to seeing if it is as huge in person as in photos. The answer is Yes. The sweet little CVCC of 1973 has ballooned into a big sedan that looks like an Accord. Its styling is so bold and carefully rendered to not look cheap that it appears overblown and is hard to remember. We need Honda to not just give us the Fit (pun avoided), but an even smaller model to compensate for this scary development. Of course, they’ll sell the usual 300,000 Civics to Americans in 2016, anyway. And, if it’s more efficient than an Accord, great! There isn’t a hybrid or electric model available yet. With my family in tow, we wandered through other areas, including a huge ballroom full of customs, which included late-model BMWs and Subarus as well as a glorious low-riding 1959 Buick and some exquisitely customized muscle cars. Also, on the main floor, behind the Chryslers and Jeeps, the selection of new and historic Aston-Martins was dazzling. The Academy of Art University brought a fabulous assortment of fine classics, from a Stutz worthy of film royalty to a sweet Austin-Healey that looked exactly like one treasured by my dad in the 1960s. And that is what makes it so challenging, and exciting, to be searching for an automotive answer to our climate problem while appreciating the beloved old internal combustion vehicles. When will a new car show include no more ICE models? Will we still love a 1941 Lincoln Coupe or a 1966 Porsche 911 25 years from now, even if they are part of what’s got us into this mess in the first place? I just returned last week from 12 days in London and Paris. The world’s eyes are on Paris now after the horrible terrorism that struck the French capital yesterday. I was walking those areas,– my hotel, and much of my wandering, were in the same part of town. It hurts me deeply to think of those beautiful streets being the scene of such an atrocity. In this blog, though, it’s all about cars. When I was in Paris and London from October 27 to November 7, I saw lots and lots of small, fuel-efficient vehicles that never make it to American shores. The argument for these smaller, more efficient vehicles across the pond has always been the high cost of fuel and also the old, narrow roads. Seems reasonable enough, but today, the world needs these cars, and some of them do find their way here. But a lot of them don’t. Wouldn’t it be nice to be able to buy the VW Polo, or the cute little Audi A1 or BMW 1 Series hatchback that I saw on London streets? In Paris, it was nearly all French cars from Renault, Citroen and Peugeot. Seeing generations of these cute little cars zipping around was heartwarming. 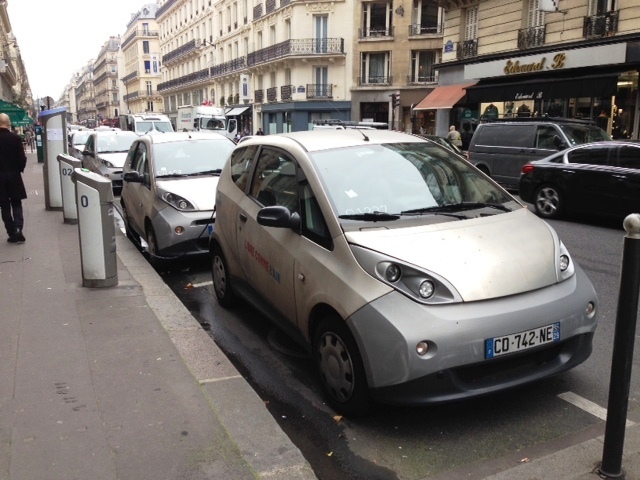 In Paris, I found numerous installations of the Autolib system. 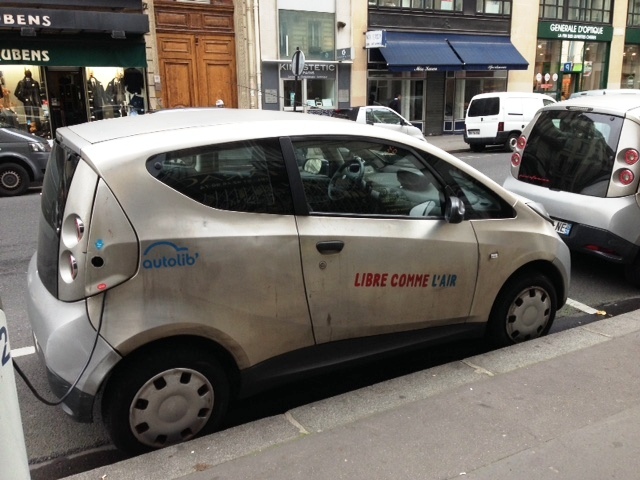 Like Zipcar, the Autolib vehicles are part of a car sharing system for members, who can claim them at the street and then drop them off at another Autolib location. What’s different is that they are all identical tiny, silver electric hatchbacks. Here’s a closer look. Made from aluminum, they have a flat surface appearance–and not all of them were especially clean. But I saw them all over the place–charging and in motion. I recently read about an American city, I believe Indianapolis, that was instituting an Autolib system. Read more about Autolib and car sharing. Of course, in both London and Paris, we used the highly efficient public transit system–London’s Underground and Paris’ Metro trains. San Francisco’s Muni system and the Bay Area’s BART network can only dream of this kind of efficiency. We also sampled intercity trains in France, visiting Versailles, and the international Eurostar, which took us from London to Paris in a brisk two and a half hours! One other note. 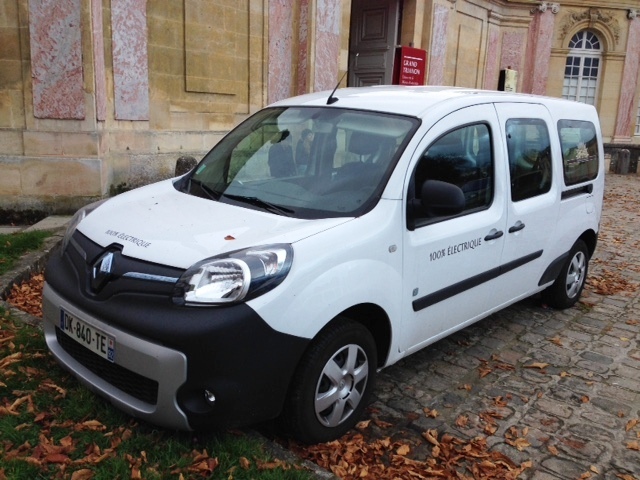 I captured this all-electric Renault Kangoo at the Grand Trianon, part of the surprisingly extensive grounds of Versailles. Cute, huh?